OK, now the thing that really set me off. Before I was born, the film was preceded by newsreels — meaningful because it was informative with a little propaganda thrown in for good measure. When I was a kid, the movie was preceded by a cartoon–meaningless, but entertaining. Now, the film is preceded by commercials–demeaningful. They are demeaning. They reduce audiences of people to mere consumers. One of the commercials that preceded the latest adventure of Katniss Everdeen as she, once again, squares off against the evils of the Capital, was for a new line of makeup for Cover Girl. And the name of this new, somewhat outlandish line? The trilogy written by Suzanne Collins is in the genre of dystopian fiction. That is, it presents a horrible world against which the protagonist must contend. The whole point of this genre, and therefore this particular movie, is to be a warning. By exaggerating and projecting into the future an aspect or aspects of our present-day culture, this movie makes us more aware of our vice, or (at least) our folly. The Capital is frivolous and exploitive. One scene, in particular, brings this home. Our heroes are forced to attend a Capital party where there are so many good things to eat, Peeta laments he cannot try them all. He is immediately offered a beverage that will empty his stomach of its contents so that he may start all over again. The irony of this is not lost on Katniss who comments that many in the districts starve while they provide all the resources for those in the Capital to maintain their lifestyle of excess. Oh, and as an external symbol of the Capital’s excess –meaningless adornment. Enter Cover Girl’s Capital Line of cosmetics. If the audience were capable of absorbing the core meaning of this film, Cover Girl would right now be attempting to recover from one of the greatest advertising debacles in history. Young women would be rushing home from the theatre to post pictures to Facebook of them destroying all their Cover Girl products, or shooting kabob skewers at magazine-ad targets with bows made of pencils and rubber-bands. But alas, Cover Girl didn’t make a mistake. They know that we are capable of believing one thing and doing another. We can root for Katniss and everything she stands for, while in our theatre seats, but when we walk into the air, we become, once again, the citizens of the Capital, blind to our frivolous and exploitive lifestyle. I’m not saying there is anything wrong with Cover Girl, particularly. I’m sure they no longer test their products on baby seals, but that they succeed in selling a product line based on the antagonist shows a disconnect. Imagine an Anglo-Saxon buying a compact car called the Grendel, or the medieval peasants wearing Turk Brand jeans, or the British public ordering up a pint of Prussian Ale–in 1916. It wouldn’t be possible. Why can Cover Girl get away with it today? Because we are different than our predecessors. For them, truth and action were inseparable. For us, there is a gap between knowing and doing. Not so, in the movie. The main virtue celebrated in the film was doing what one knew. 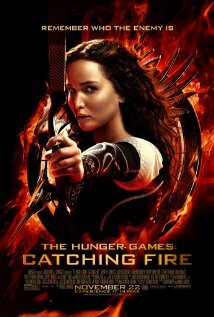 Katniss and the rest of the good guys knew the Capital was wrong in their exploitation of others and that things needed to change, so they did something about it, even in the face of great pressure to do otherwise. They each embodied the anti-Capital attitude of self-sacrifice. As a matter of fact, this is the primary error of President Snow–he assumes that once in the arena, Katniss she will betray her professed altruistic values and become the killing machine he knows her to be. He is right that if she does this, the revolution will be over. All of the revolutionaries are banking on her constancy–and she lives up to these expectations. It is not only Katniss that embodies the anti-Capital attitude of self-sacrifice; for Peeta, Gale, Haymitch, Cinna, Mags, Fennick, and Prim there is no gap between knowing and doing. I loved this movie because it was true, but does it really do any good if we don’t act on that truth? And do we really live in an age when art no longer has any effect? Are they doing that in Canada now? They did that in France when I lived there, shortly after the Revolution. Made my blood boil. The only ads God allows in movie theatres is trailers for other movies, PSAs, and reminders to shut the hell up. If they’d make commercials entertaining, like the best of those during the Super Bowl, and they wouldn’t show them on television so I’m seeing this excellent and entertaining commercial for the first time, then I wouldn’t mind so much. At least I’m getting something out of it. I want the cartoon back. Or like Pixar does with a little short at the front — that’s treating the audience with respect (or at least it feels that way). Thanks for commenting–I always find you comments interesting or entertaining.